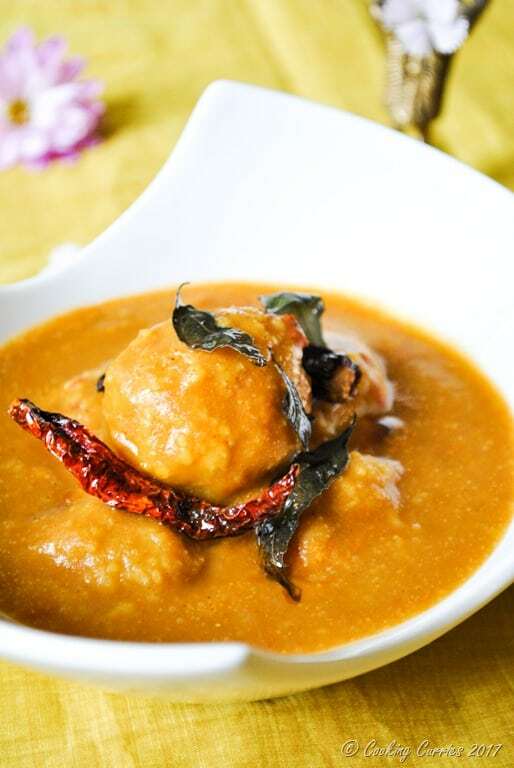 Tangy and just a little spicy curry with a tamarind sauce base and spiced lentil balls cooked in it. 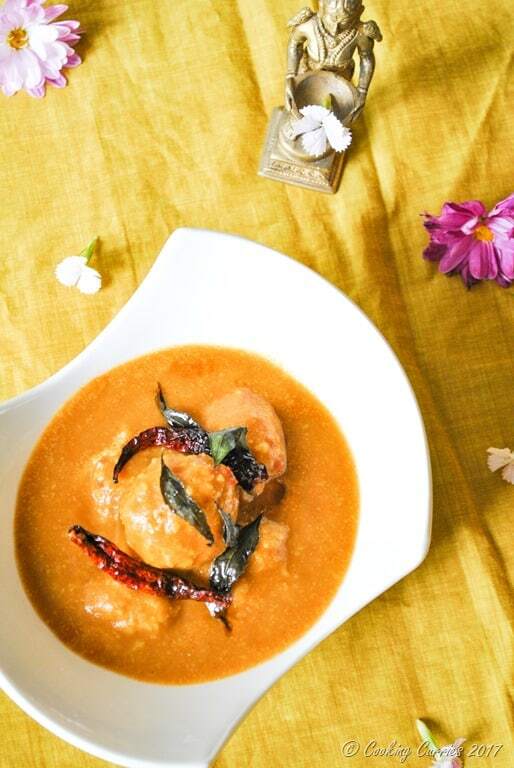 This Paruppu Urundai Kuzhambu is a staple curry that accompanies rice, in any TamBrahm household in India. Its been years and years since I have tasted this. It never was one of my favorites and I used to like it just because it was a change from the regular sambar or pulisseri or pitla. But some dishes like this just bring back good old memories and you want to have them just for that. A couple of weeks ago, I was talking to a friend of mine about what all amma used to make everyday and on special occasions and happened to mention Paruppu Urundai Kuzhambu to her. That is when I realized that I have never made that by myself and worse, I did not even know the recipe for it. Made it a point to ask amma the next time I spoke to her – got the recipe from amma – made it – photographed it – ate it – loved it and now blogging about it! 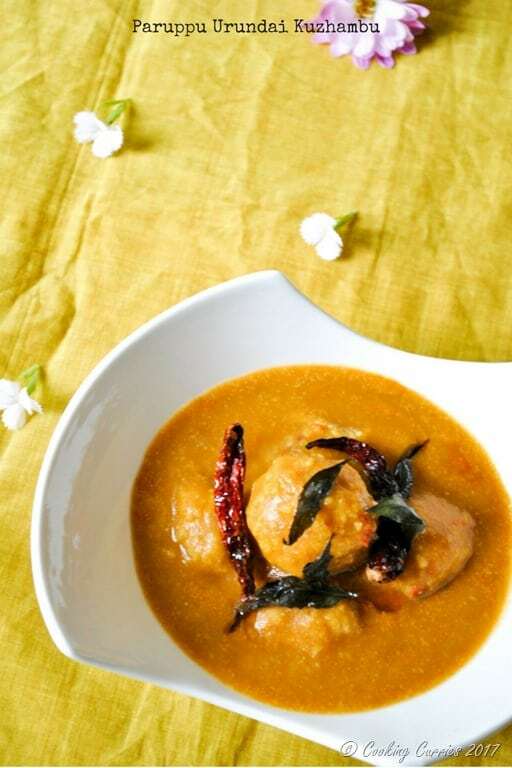 Paruppu is dal/lentils, urundai means balls (more specifically something spherical) and kuzhambu is a generic term for any gravy based dish and here is amma’s recipe for this delicious tangy lentil gravy. The lentils are soaked in water with some chillies, asafetida and curry leaves and the ground to a very coarse paste, then cooked in the spiced tamarind sauce, till it absorbs all that deliciousness from the sauce. It is best enjoyed with some rice and a side of vegetables. Wash the lentils well and soak them in water with the curry leaves and red chillies for 1/2 hour to 1 hour. 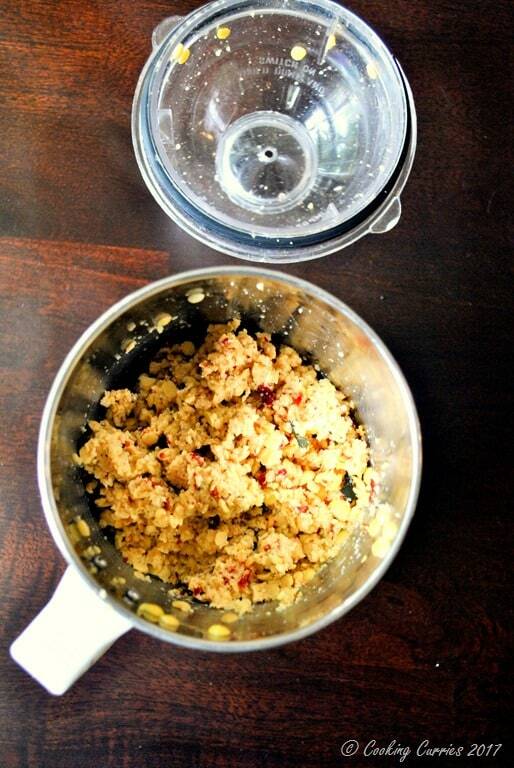 Grind to a coarse paste (just pulse one or two times) with the salt and asafoetida. Take out almost all of it leaving behind maybe 1/4 of it in the food processor. Grind it to a very smooth paste and keep aside. Make small key lime sized balls of the coarse mixture and keep aside. Squeeze out the pulp from the tamarind and keep adding more water and squeezing the pulp from the tamarind till when you add water next its almost pale. Repeat this for maybe about 4-5 times. Keep a pot over medium heat and pour the tamarind pulp in it. Add a little water if it is too thick. Bring it to a boil and add the smooth lentil paste to this. Add salt and the sambar powder too. Let it boil for a while and add the lentil balls to it very slowly. Make sure they dont break. Let it cook for about 15-20 mins without stirring.